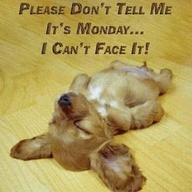 I couldn’t resist the picture….And so the work week begins – with a groan, some disbelief and at least one hit of the snooze button…Wherever the week leads you – hope you have a great one! Posted on May 21, 2012 by mimijk •	This entry was posted in Uncategorized. Bookmark the permalink. This is exactly the way Beau slept as a baby–ADORABLE! Thx for the Monday morning smile! Archie slept that way too – I loved it!!! Happy Monday to you too Mimi…let the fun begin! loved this and agree wholeheartedly!